MKs demand investigation after TV report says leftist group may have gathered sensitive information. Israeli politicians from both left and right were fuming on Thursday evening, after a Channel 2 investigative report revealed that members of the leftist organization Breaking the Silence apparently tried to gather intelligence about sensitive IDF operations along the border with Hamas. Minister Ze'ev Elkin (Likud) said he was “shocked by the findings of the investigation on Breaking the Silence...such activity has no connection to an ideological debate about what is happening in Judea and Samaria, raises serious concerns over the use of Breaking the Silence as a spying tool against the IDF and requires an immediate investigation of the Shin Bet and the Military Police. If necessary, those responsible should be brought to justice." Deputy Foreign Minister Tzipi Hotovely (Likud) called the findings of the investigation “serious” and added, "I call on the police and on all relevant parties to immediately investigate the findings and reveal once and for all the truth behind the organization." Deputy Defense Minister Rabbi Eli Ben-Dahan (Jewish Home) said, "I urge the Israeli police and the Shin Bet to immediately launch an investigation following the reports about Breaking the Silence and bring them to justice." "There is no doubt from watching the report that this organization is a fifth column and that these are individuals whose sole purpose is to collect intelligence and operate against security forces in an improper manner," Ben-Dahan added. Knesset Speaker MK Yuli Edelstein (Likud) said he was stunned by the findings and believes that they have nothing to do with human rights, which Breaking the Silence claims to deal with. Members of the opposition reacted angrily to the investigative report as well. MK Eitan Cabel (Zionist Union) said that "the activities of Breaking the Silence, as revealed tonight, crossed a red line that should not be crossed. These are very serious findings which point to the systematic gathering of evidence against the army, against the state, against us. There is no choice but a police investigation." MK Itzik Shmuli (Zionist Union) added, "The findings are very serious and very disturbing and there's no difference between left and right in this matter. Instead of [Breaking the Silence's] declared activities with regards to human rights – we discovered a subversive activity of collecting classified intelligence and operational information that we do not know to whom it was passed on and for what." "The police must immediately open an investigation. Breaking the Silence has long ago crossed the line between legitimate criticism and destructive activity which blackens the face of Israel in the world and now is apparently engaging in activity that could harm its security. These guys have lost the right to say anything in the name of morality,” added Shmuli. Yesh Atid chairman Yair Lapid said that "Breaking the Silence undermines the State of Israel and causes untold damage to the State of Israel and its soldiers. This organization does not have any right to exist in a country which fights terrorism on a daily basis." MK Oded Forer (Yisrael Beytenu), meanwhile, wrote a letter to the Attorney General calling on him to open an urgent investigation against the organization. In his letter, MK Forer wrote that "the manner of collecting evidence, including preliminary mobilization, targeting specific units, collecting information on IDF operations and its weapons and other disturbing evidence, raise a clear concern that serious security offenses were committed in this case." 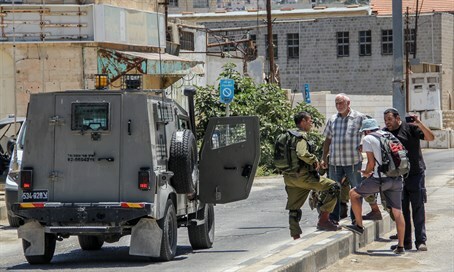 "There is no doubt that a black flag is flying over the activities of the organization and an investigation against it must be launched immediately, because every day that passes leads to further risks to Israel and its citizens, soldiers and other security forces," wrote Forer. Breaking the Silence CEO Yuli Novak, in response to the Channel 2 report, denied the organization had collected any classified materials. "We work closely with the military censor and we do not plant soldiers in the Civil Administration to get information," she said.